This post was written as part of the second annual Middle Eastern and North African Heritage Month series from Multicultural Kid Blogs! More information can be found at the end about the series. One of my daughters will be entering a new school this year. When that happens, I always make an excuse to wander into the new school library and see what they have as far as reading material about the culture and history of the Arab world. There is so much confusion facts coming from the media, I want to be sure that my daughter and her peers read first hand from diverse voices directly in this region of the world. So next week, I’ll be taking my list below of recommendations to the school librarian when I introduce myself. It’s always good to be proactive in your children’s education and environment. I hope others may befit from this list. Feel free to visit the Crafty Arab Authors Pinterest page for adult Arab books recommendations. Book writes ups are from Amazon. A brilliant military strategist, superb horseman, statesman, philosopher, Muslim hero . . . Emir Abdel Kader (1808-1883) was an international celebrity in his own time, known for his generosity and kindness even towards enemies. Today he is recognized as one of the noblest leaders of the 19th century and a pioneer in interfaith dialogue. This fascinating biography of the heroic Arab who led the resistance to the French conquest of Algeria, endured betrayal and imprisonment, and in 1860, in Syria, saved thousands of innocent people from mob violence brings a vital message for our times. Mara is a proud and beautiful slave girl who yearns for freedom. In order to gain it, she finds herself playing the dangerous role of double spy for two arch enemies – each of whom supports a contender for the throne of Egypt. The United States and its allies invaded Iraq seven years ago. Today the country is still at war, and no one can claim that true democracy has come. Four million Iraqis have been displaced, and about half of them, unable to flee the country, are now living in remote tent camps without access to schools, health care, or often even food and clean water. In Children of War, a companion title to Off to War: Voices of Soldiers’ Children, Deborah Ellis turns her attention to the most tragic victims of the Iraq war — Iraqi children. She interviews two dozen young people, mostly refugees living in Jordan, but also a few who are trying to build new lives in North America. Their frank and harrowing stories reveal inspiring resilience as the children try to survive the consequences of a war in which they play no part. A biography profiling the life of Queen Noor, the American-born queen of Jordan. Includes source notes and timeline. On August 2nd, Danah is ready to embark on the most fantastic vacation of her life–a visit to Disney World, when Iraq invades her country Kuwait. Overnight, her status changes from a spoiled wealthy girl to a homeless refugee. Stranded in New York with her uncle, Danah loses contact with her family in Kuwait. Would she ever see them again? Could she ever say, I’m sorry to her loving parents? Too anxious to wait for an international resolution to free her country, Danah stealthily returns to Kuwait and witnesses the horrors of war and destruction. Faten’s happy life in her village comes to an abrupt end when her father arranges for her to work as a maid for a wealthy Beirut family with two spoiled daughters. What does a bright, ambitious 17-year-old do when she is suddenly deprived of her friends, family, education, and freedom? Enlisting the help of Marwan, the mysterious, wealthy young man who lives in the next apartment building, Faten finally figures out how to pursue her studies in secret. Even against the uncertain backdrop of the civil war, their romance develops, as Marwan and Faten conspire to exchange notes and meet at an idyllic seaside café. But in Lebanese society the differences in religion, class, and wealth are stacked against them, and their parents have very different ideas about what their futures should be. An engaging and lucidly written coming-of-age novel. After being caught in Somalia’s horrific civil war, Zamzam escapes with her mother, sister, and brothers to America. But when she arrives, she learns that she has to deal with biases and stereotyping she isn’t prepared to handle. Zamzam dreams of making a difference in this world, and she wants to be seen as a person who has value. A comic novel in which hurling fanatic Benny is suddenly landed in Tunisia, where life becomes hectic when he meets Omar. The two boys beat the language problem in their own unique way. Ink-filled pens, mattresses, and bars of soap—these are only some of the inventions and innovations that have been passed down through the millennia from the peoples of Arab lands. Readers may be surprised to learn that they have also given us • the scalpel • planetariums • three-course meals As in the other titles in this series, The Arab World Thought of It uses stunning photos and well-researched information to provide an overview of contributions made in the fields of medicine, architecture, food, and education. Also included is a look at accomplishments in the areas of engineering, transportation, and oil production. Complete with maps, timeline, index, and a list of further reading, this book is an excellent starting point for the exploration of a thriving culture. Feel free to visit my affiliate shop for list of more children and adult Arab books. You can also find me on Goodreads. 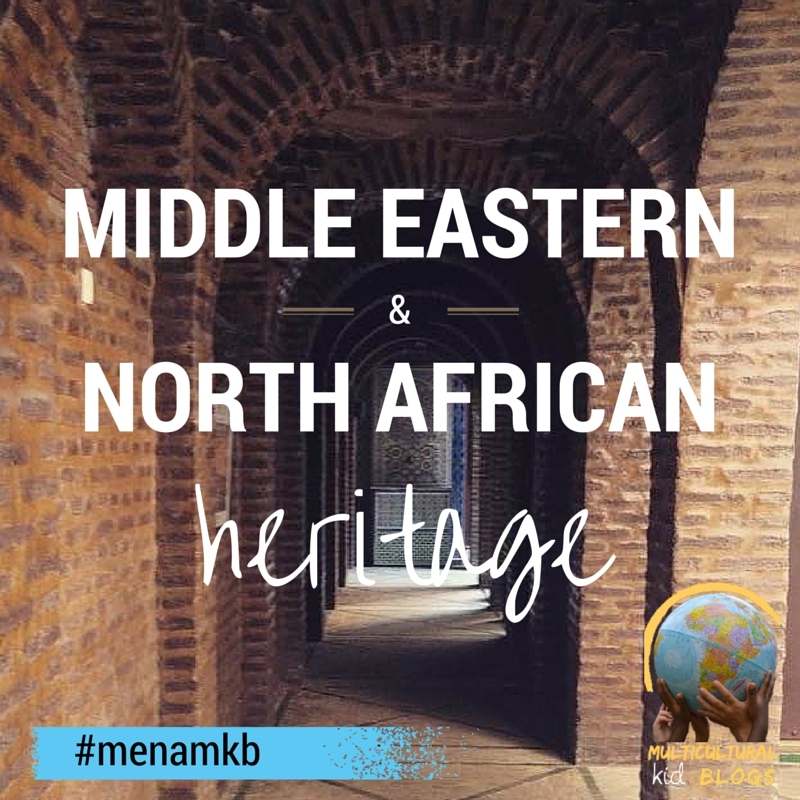 Link up your posts on teaching kids about North African and Middle Eastern heritage!